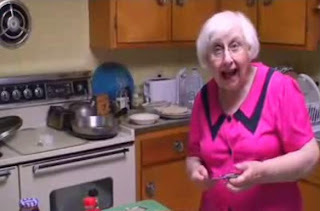 Jewish Humor Central: Look Out, Rachael And Emeril -- Here Comes "Feed Me Bubbe"
Look Out, Rachael And Emeril -- Here Comes "Feed Me Bubbe"
Two years ago, an 83-year-old short, stooped, white-haired Massachusetts grandmother with a kindly face was happily retired from her bank job. Then her grandson Avrom Honig graduated from Worcester State College with a degree in communications. That was the start of a new career for both of them -- Avrom as the producer and Bubbe (she will not disclose her real name) as the star of an online cooking show. ...she’s inundated with e-mail — ‘‘without exaggeration, hundreds, even thousands’’ — from fans from as far away as China and Africa who want help roasting chicken or stuffing cabbage, or to confide in her about their tsuris (troubles). She’s got a website (http://www.feedmebubbe.com/), a frequently updated Facebook page (‘‘on the set right now working on the cholent episode’’), and an online store selling her T-shirts, aprons, even a ‘‘Feed Me Bubbe’’ ringtone (original klezmer music, composed by a fan). Though she didn’t set out to do so, Bubbe has managed to stand out from the pack by embracing the new technology while just being herself, cooking old-fashioned dishes in an old-fashioned kitchen in old-fashioned ways. In the process, she has tapped into a market of peripatetic, family-starved young people who are hungry for more than just chicken soup. They’re hungry for Bubbes. In the video below, Bubbe congratulates YouTube on its fifth anniversary and notes that Feed Me Bubbe is celebrating its fourth anniversary. We follow this with one of Bubbe's cooking videos in which she prepares sweet and sour meatballs. Enjoy! I'll try it. Looks like a winner.